‘Never a Crossed Word’ is a fun package for all ages. It is said that if students can’t say it, they can’t write it, and this resource focuses on developing students’ speaking and listening skills, giving them opportunities to describe and explain in a highly structured, fast paced game format. The pictures are not mere decoration. They give students clues and ‘entrances’ to the word that they are trying to describe, and as such, are integral to the game. The resource can be used as a lesson starter, as an end of term activity, and is particularly useful for working with small groups / pairs. More particularly, it allows those students who may be reluctant to express themselves the opportunity to do so in a fun way. 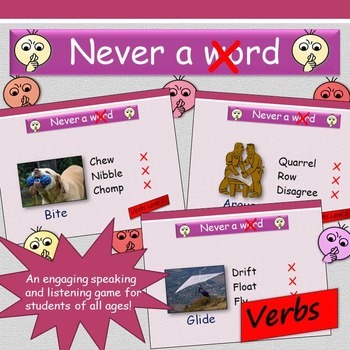 This resource provides sixty games (sixty slides – two levels of difficulty) all focused on verbs. Over the next two weeks, there will be more resources, focused on adjectives and adverbs.